After his dad's death, he felt a 'void of pain.' Then Scouting rushed in. Chuck Eaton (left) and Kevin Conolly, a fellow Storer Scout Reservation staffer and the best man at Chuck's wedding. Chuck Eaton was a 17-year-old camp staffer when he got news no teenager should face. It was the summer of 1987 at T.L. Storer Scout Reservation in New Hampshire. It was a Wednesday. Eaton had changed out of his Scout uniform and was waiting for his mom to pick him up. What happened next is something Eaton will never forget. It illustrates the power of Scouting to unite strangers and make the world better. And it’s a big reason that Eaton has devoted his career to Scouting. He’s now the Scout Executive of the BSA’s Spirit of Adventure Council, which serves the Boston area. 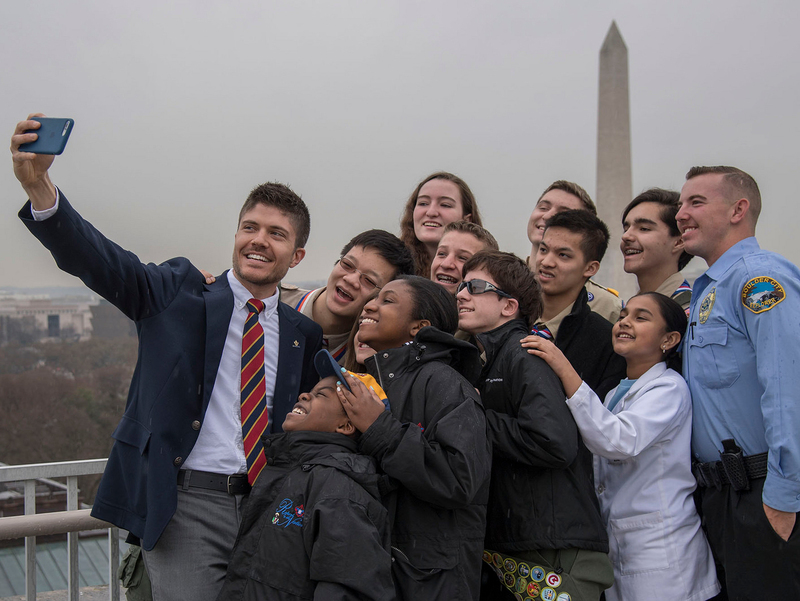 Now he’s helping a new generation of Scouts discover their Scout Spirit. It was the fifth week of summer camp, 1987. On Tuesday, Eaton was wearing a Scout uniform teaching Scouts how to rappel. On Friday, he was wearing a suit and tie shaking hands with distant relatives and people he didn’t recognize. “It all happened so quick,” Eaton says. Eaton’s sisters were popular and had friends who would hug them and cry with them. The day of the funeral arrived, and Eaton and his family were seated in the front row. Still stunned from the week’s events, Eaton found his mind wandering to Storer Scout Reservation. The camp was just 80 miles from Boston, but that felt like 800. “I was in a daze, and honestly, I just wanted to get back to the wilderness and the culture of camp,” Eaton says. “It broke my heart not to be able to share any of this with my friends. After the funeral service, Eaton, his mom and two sisters followed the casket out of the church. The 1987 staff at Storer Scout Reservation. Eaton looked up, expecting to see a bunch of his dad’s friends. Instead, he saw pretty much the entire camp staff — the reservation director, camp directors, program directors, waterfront directors, ropes course director. He saw dozens of his fellow youth staffers, too. The tears began to flow as Eaton realized what kind of support system Scouting had provided. After the burial at Saint Joe’s Cemetery, everyone arrived at Eaton’s grandmother’s house. That’s when Eaton had a realization. If all of his fellow staff members are here, he wondered, who is running camp? Eaton walked over to camp director Rick Martin and asked the question. “Thirty years later, Rick’s answer still brings tears to my eyes,” Eaton says. Martin told Eaton that the staff made a phone tree and called all the Scoutmasters who weren’t in camp that week. Martin asked them whether they’d be willing to come out and help run the camp so the regular staff could attend the funeral. “That meant 40 men from all over greater Boston took two extra days off from work and drove up to New Hampshire, so all my friends and mentors could come back to Boston to be with me,” Eaton says. The Scoutmasters, plus a few camp staffers who stayed behind, ran the camp for 12 hours. They taught swimming, outdoor cooking and rock climbing. They made it work, because it was the right thing to do. “Many of these men had hourly jobs. Many, probably all, of them already committed a week of vacation for the Scouts in their troop,” Eaton says. “Now they took another day or two for a 17-year-old staff member they probably barely knew.